Jason continues to fight an ongoing war against the mice who are invading his garage. Early on, he adopted a "take no prisoners" approach. 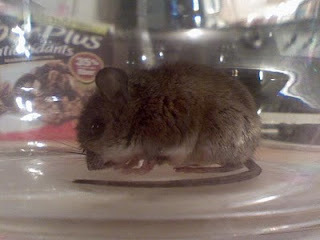 Recently, however, he made an exception to the policy when he cornered a baby mouse in the garage. He trapped it under a glass and released it in a nearby field. A pic is posted below.